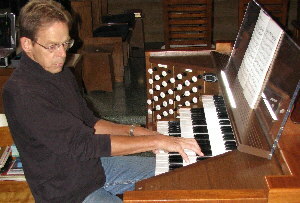 Craig Jaynes, tonal director of Jamestown Organ works, is Music Director and organist at St. Colman Church in Washington Court House, Ohio since July of 2005. He has served churches in Ohio and Kansas as an organist and choir director for the previous forty-three years. He attended Wichita State University and The Ohio State University, is a graduate of Kent State University and studied organ with Paul Lundquist, Dorothy Addy, Diane Bish and Virgil Fox. He shares his home at English Garden Farm, outside of Jamestown, Ohio with thousands of plants and is happy to welcome visitors to the same during the season. In real life, he is a Registered Nurse (Clark State Community College, 2005) with Community Care Hospice of Wilmington.